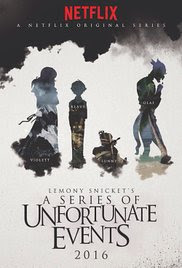 Netflix announced that its adaptation of Lemony Snicket’s A Series of Unfortunate Events which will premiere on Jan. 13, 2017. The adaptation — based on the author’s series of dark and depressing young adult (13) novels — has been in production over the past year. Netflix has teased images and Snicket's from the series over the last couple of months, but released the first official teaser trailer for the show. The series is set so far for eight episodes each book in the series would be adapted into two episodes of the series, with the first four books covered in the initial eight episodes. Watch the first Lemony Snicket's A Series of Unfortunate Events teaser trailer below; Patrick Warburton (Rules of Engagement, Family Guy, Seinfeld) plays Snicket, giving a devious, fourth-wall-breaking introduction. I'm so excited for this! Haven't read the series in a while, but must give it a re-read before January. Can't wait to become friends with the Baudelaires all over again.